Back in 2007, when the Internet was still being settled, I was in one of those lines that stretched around the block to ensure that the day it came out, I had a brand new first generation iPhone in my greedy little hand. Once acquired, friends and family were all amused by the machine, but saw little use for it in their own lives. The revolutionary, all-in-one device was an expensive fad that they imagined would calm down. Life had changed though, and I knew it was just a matter of time before what was in my pocket was the norm instead of a curiosity. Five years later, my retired mother, more than a little bored, adopted a smartphone baby, shortly thereafter becoming an excellent texting conversationalist, casually sharing with me links to favorite YouTube finds. She blossomed online and is currently the Facebook page administrator for one of her social groups. My mom is a special case. She’s very curious and took to virtual reality like a duck to water. Not everyone is as interested. It takes all kinds. In 2017, more than 2/3 of adults over 65 have cause to be online, with well over half of that number identified as being active Facebook users. That means that chuckling over technology-challenged grandparents has an expiration date, and it’s now! 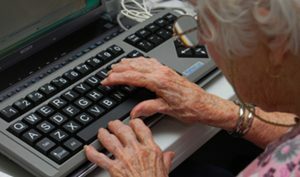 The cohort we call “oldest old” (85+) still tends towards pencil-and-paper or maybe typewriter modalities (and that doesn’t look likely to change), but aging boomers have rushed online in droves. Some overeducate themselves regarding proper safety, locking their identities down in privacy settings to the point that “social media” loses meaning. Meanwhile, others prefer to bleed important personal information to anyone listening. What can seniors expect from online dating? What services or sites have engaged them as a group? What does a secure and social Internet experience look and feel like for aging adults? We hope you’ll join us for this topic each Monday for the next four weeks, commenting and sharing this important, somewhat unusual conversation with your own corner of the Internet.